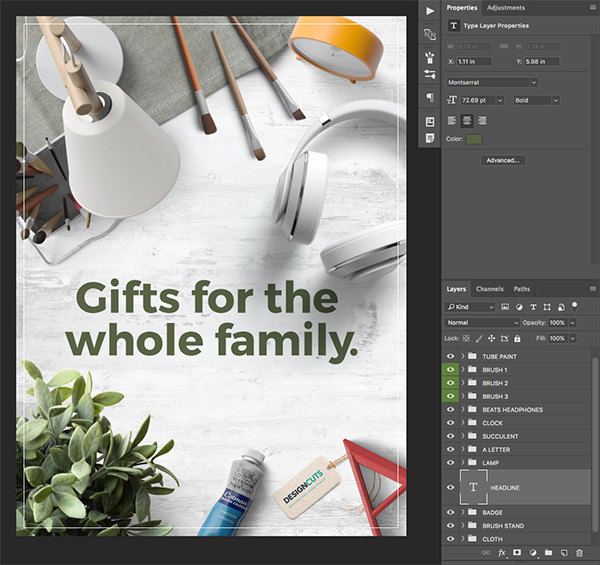 In this design tutorial I will be showing you how to design a poster for a department store using various objects in Photoshop. 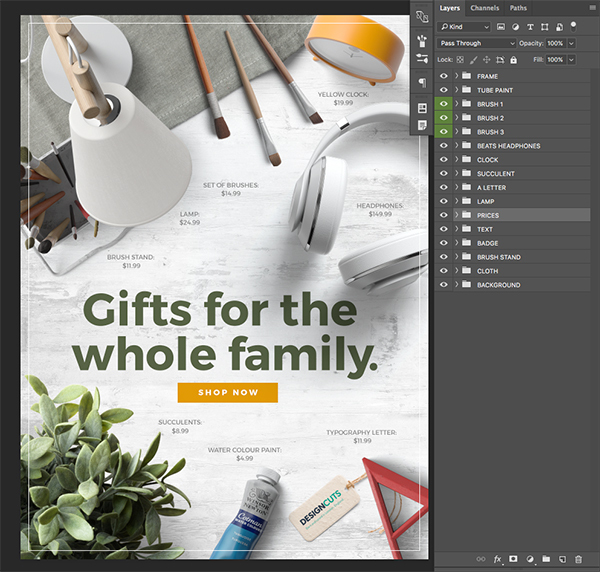 After we create our poster we will then present it using one of the awesome interior mocks from this latest bundle to showcase our work in an inspiring and professional way! 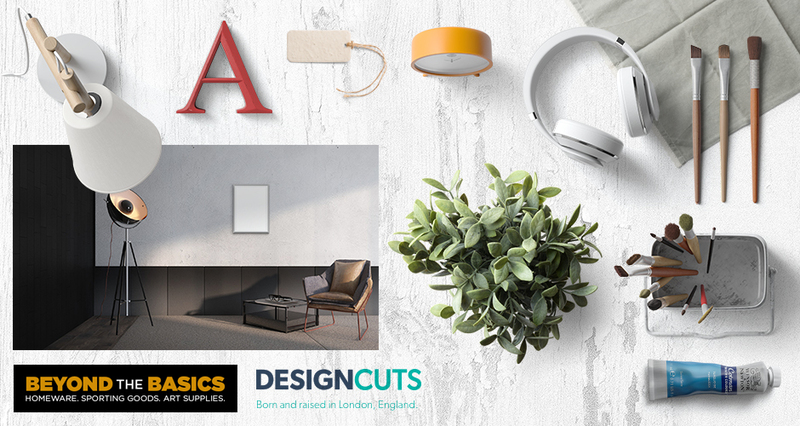 This freebie pack includes a range of realistic scene creator items, including tags, headphones, brushes, fabric tableclothes, succulents, a lamp and clock. 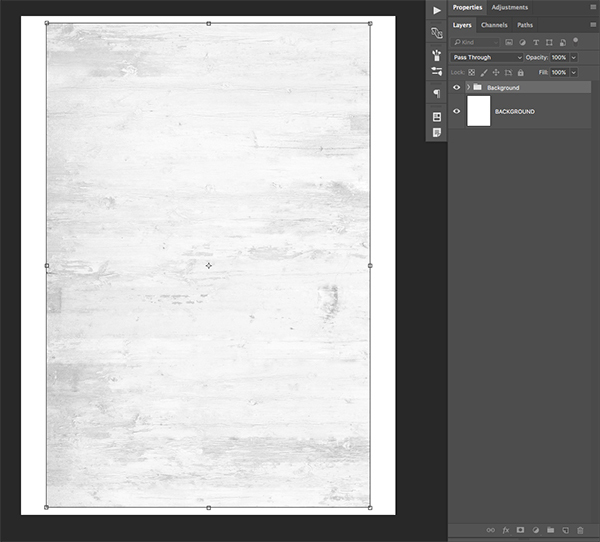 It also includes a background texture and interior mockup template. 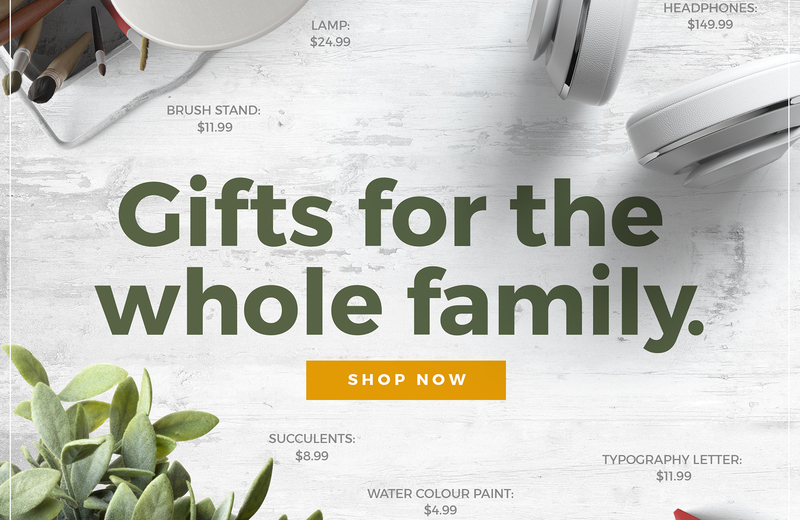 The freebie pack is just a sample of what you will find in the The Complete Mockup Templates Toolbox for just $29 (that’s 99% off). This bundle contains 1000’s of stunning mockup templates and scene creator items that would be incredibly time-consuming, and downright impossible to create for most designers to create. All of these mockups are super sharp and highly customizable, and they will help you present your work in a truly unique and professional way. 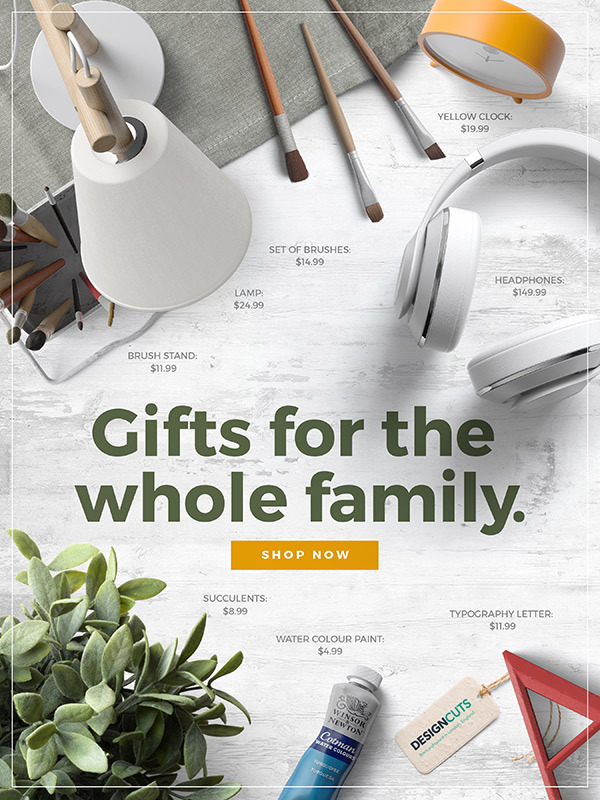 Don’t miss out on this amazing deal where you will have access to amazing mockups for packaging, apparel, 3d renders, posters, rooms, and so much more! 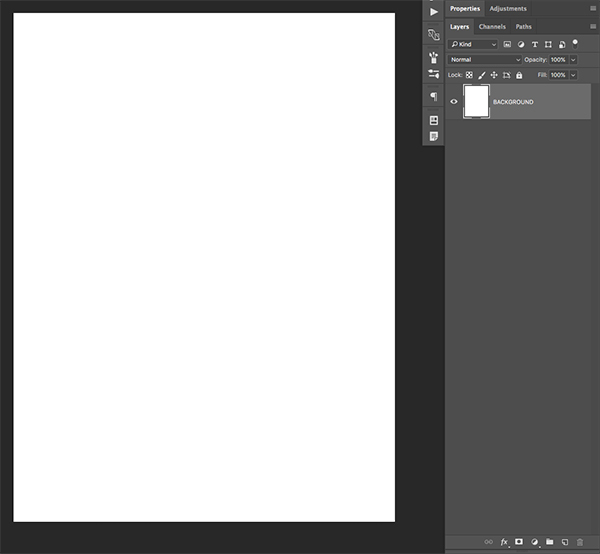 Let’s begin by opening Photoshop and creating a New Document. 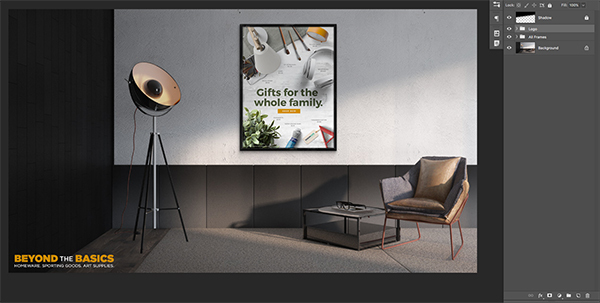 Since we will be creating a poster design we want to work with a fairly standard poster size. 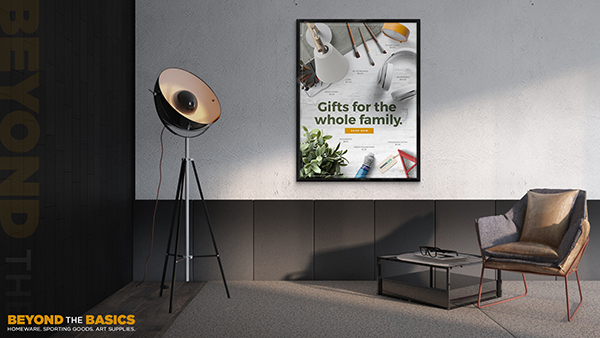 The mockup that we will be using to present the design contains a frame that is made for an 18” x 24” poster, but since it will be a digital image and not a full size print, we can create our poster at half of that size. 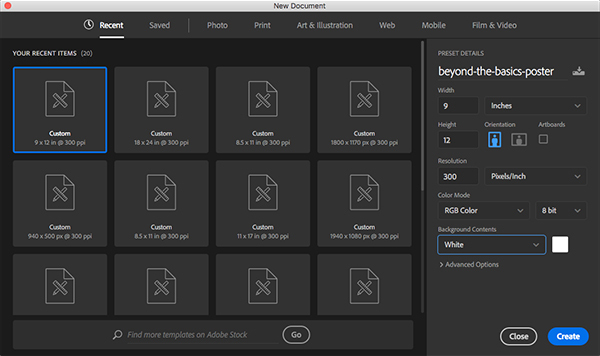 So, let’s start with a document that is 9” wide by 12” tall with a resolution of 300, Color Mode of RGB, and set the Background Contents to ‘White’ which we can leave for now. Once you have set the parameters go ahead and click ‘Create’ to make your document. Once we create our new document we should have one single layer named ‘Background’ that appears with a small lock icon next to it. 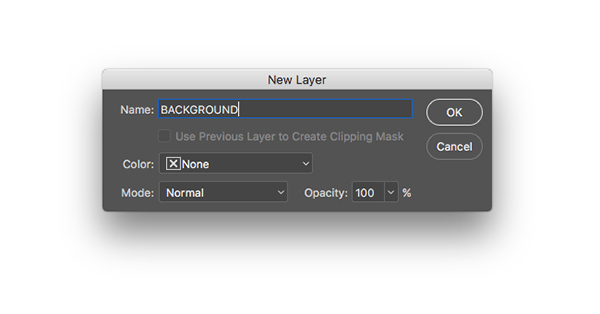 Double click on the ‘Background’ layer to unlock it and you will be prompted with a dialog box asking you to name the layer. 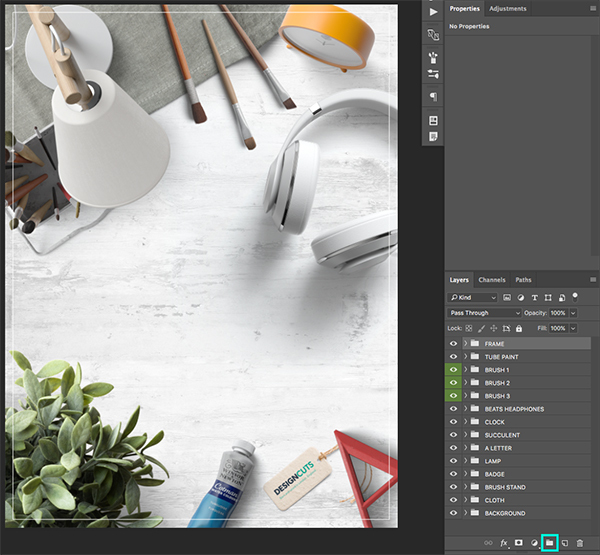 Let’s enter ‘BACKGROUND’ for the name and then click ‘OK’ to apply the changes and unlock the layer. 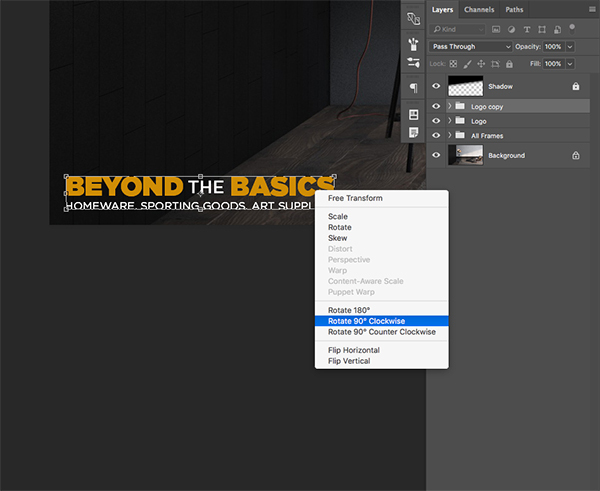 Open the freebies folder for the tutorial and then locate the ‘top_scene_background.psd’ file before opening it in Photoshop. Select the ‘Background’ folder inside of this file and then drag it into your working document while holding the Command/Ctrl+Shift Keys. 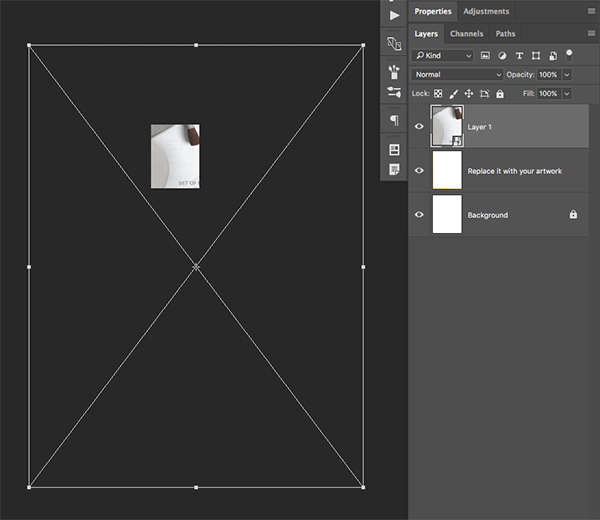 Doing this will ensure that the folder gets brought over into your document and dropped right in the center of the canvas. 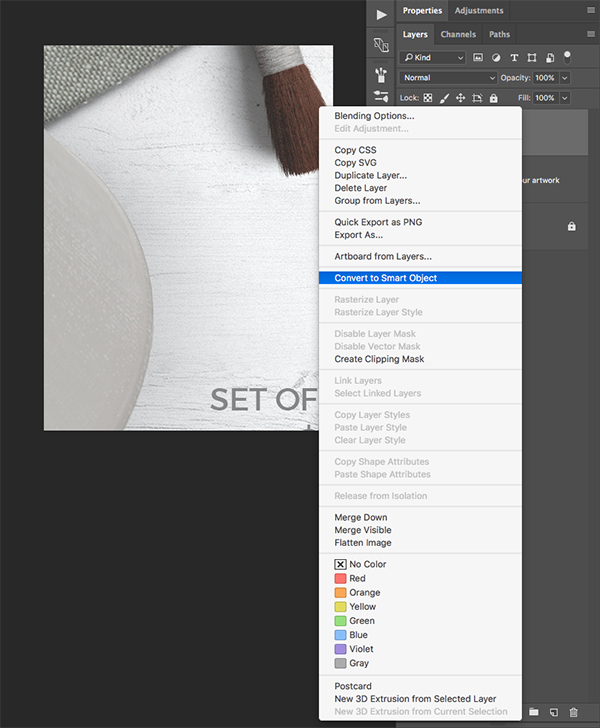 After unlocking both of these layers we can grab the ‘Background Color’ layer that is currently turned off and simply delete it or drag it to the trash can icon found at the bottom of the Layers Palette to remove it. Select the ‘Background’ folder that we have brought into our file, and then press Command/Ctrl+T to initiate a Free Transform Command. 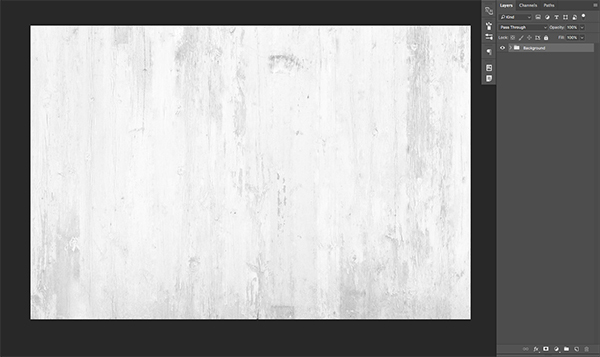 Now that our background is completely filled with the white wood texture we can press ‘Enter’ on the keyboard to apply the transformation. 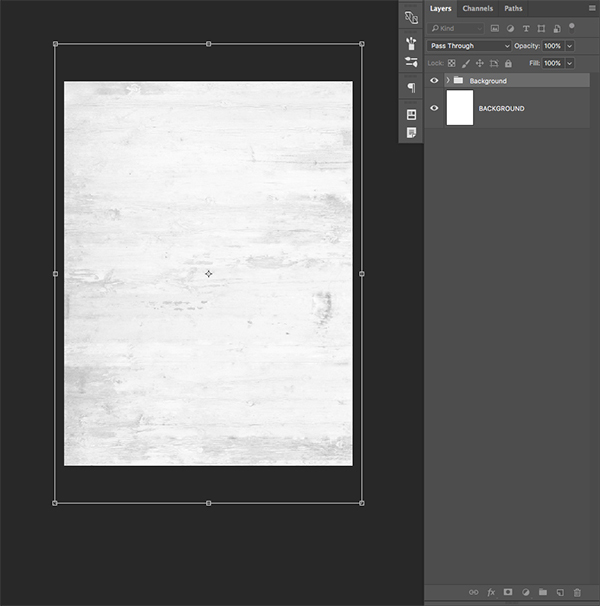 Next, we can select the original ‘BACKGROUND’ layer and drag it to the trash can or simply delete it since we no longer need it. 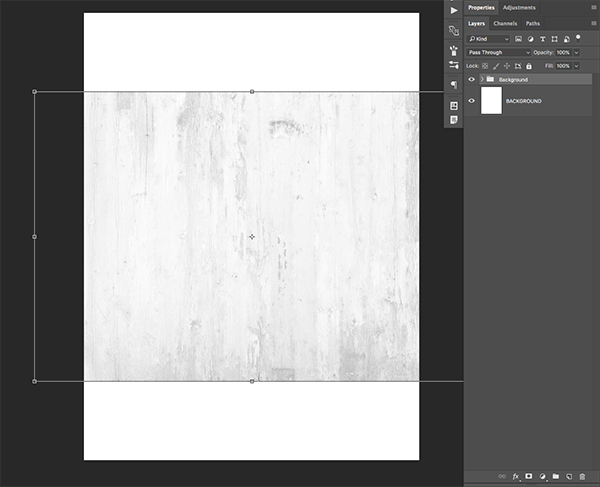 We can now use that name for the folder so we are left with only the wooden texture background. 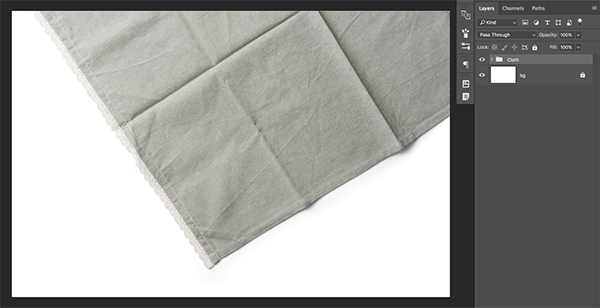 Open the freebies folder for this tutorial and then open the ‘fabric_tablecloth.psd’ file in Photoshop. 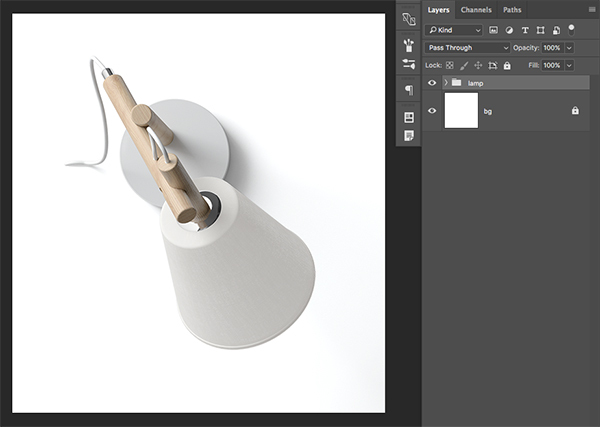 Open the freebies folder for this tutorial and then open the ‘white_lamp.psd’ file. 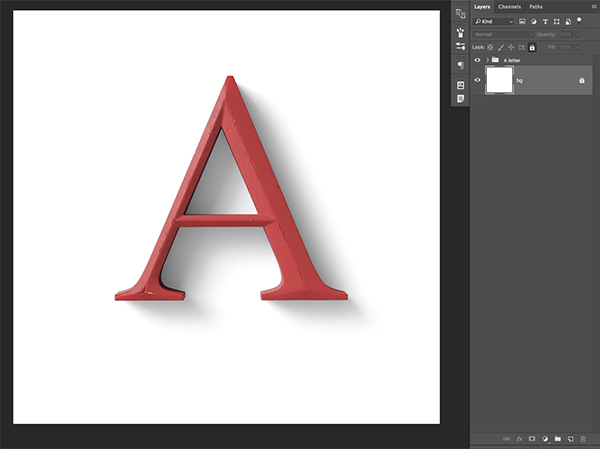 Next, open the ‘a_letter.psd’ file in Photoshop. 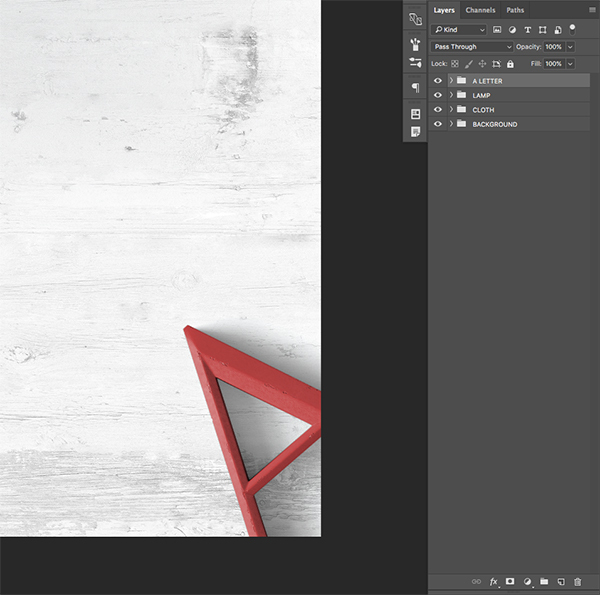 Click and drag the ‘A letter’ folder into your document while holding Command/Ctrl+Shift on the keyboard so that it falls in the center of your canvas. 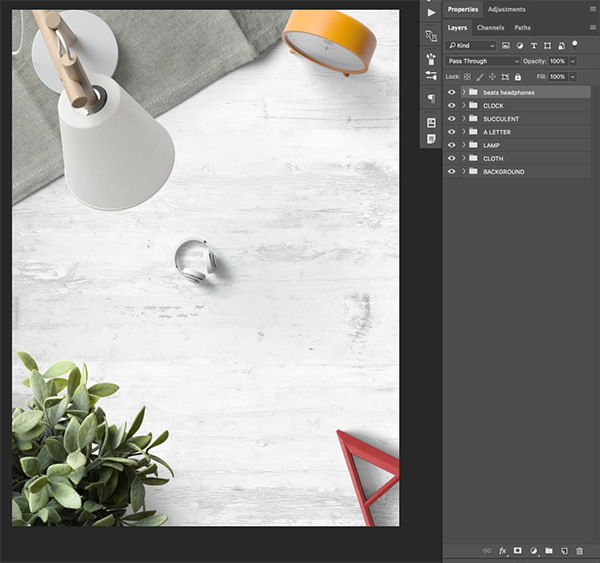 Having the letter point towards the center of the image balances out the shape and direction of the white lamp, and this is a useful way to create some interesting angles and lead the viewers eye towards the center of the image. 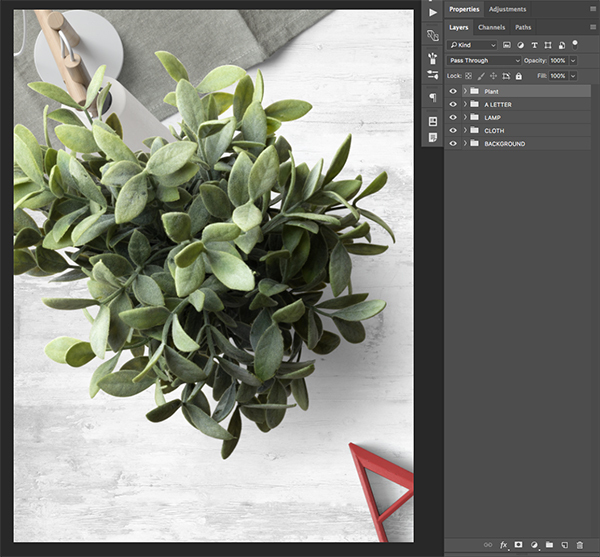 Next, open the ‘succulent.psd’ file from the freebies folder in Photoshop. Click and drag the ‘Plant’ folder into your document while holding the Command/Ctrl+Shift keys. 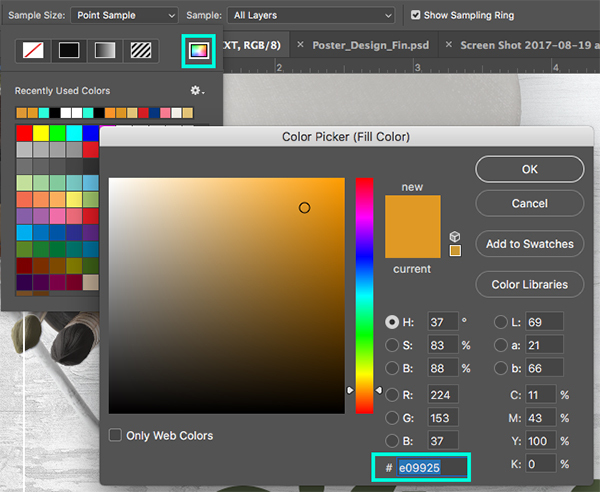 The next object we are going to use from the freebie folder is the ‘yellow_clock.psd’ so let’s go ahead and open that in Photoshop. From here we want to click and drag the ‘clock [C]’ folder into our working document while once again holding the Command/Ctrl+Shift keys. 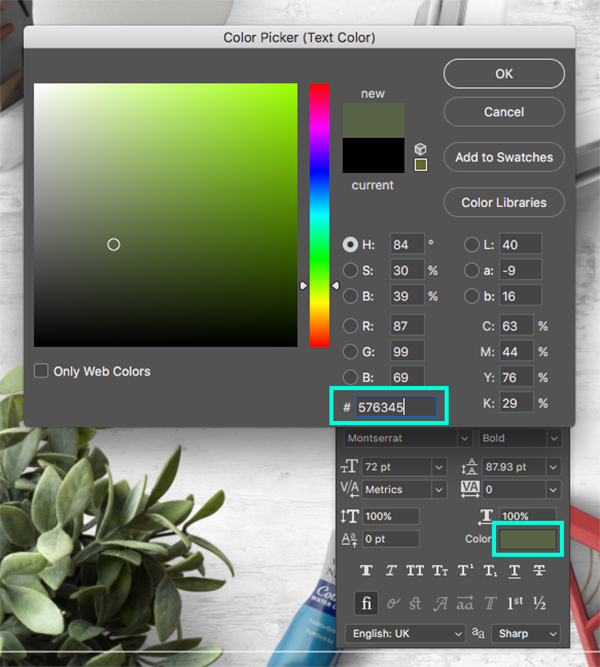 Once we bring the yellow clock into our document, place the folder at the top of the Layers Palette and double click on the folder to rename it to ‘CLOCK’ in all caps just like we have been doing with all of our previous folders and objects. Since the clock is fairly small, we will scale it up by pressing Command/Ctrl+T to initiate a Free Transform, and then holding the Alt/Option+Shift keys and dragging outwards from any of the four corners of the bounding box. Next, rotate the clock so that it faces down and towards the left, and then place it in the upper right hand corner of the image. It should be directly across from the plant to create more balance and to also point the viewers eye towards the center of the image. Use the image below as a guide for the size and placement of the object. 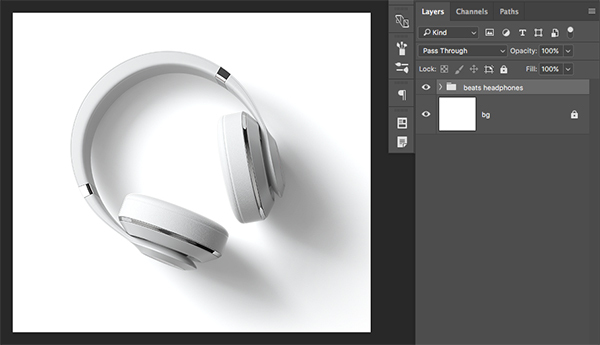 Next, open the ‘beats_headphones.psd’ file in Photoshop. From here we want to click and drag the folder with our headphones into our document while holding the Command/Ctrl+Shift keys. 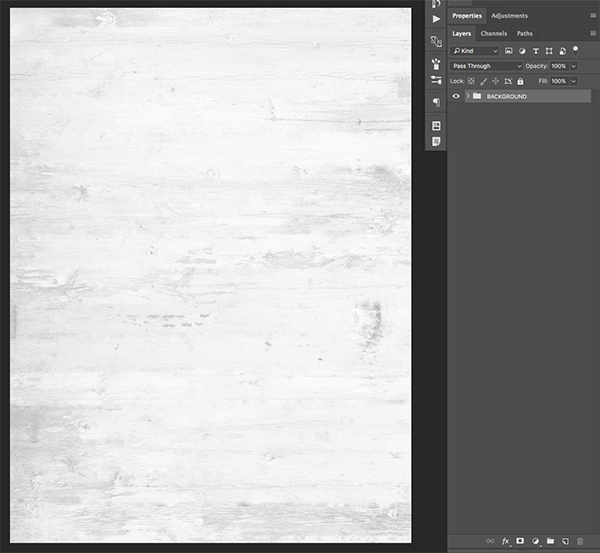 Next, open the ‘brushes.psd’ file from the freebies folder for this tutorial. 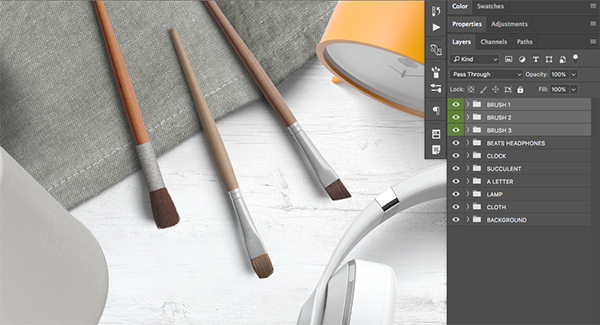 You will notice that this file has three brushes inside as opposed to a single object. 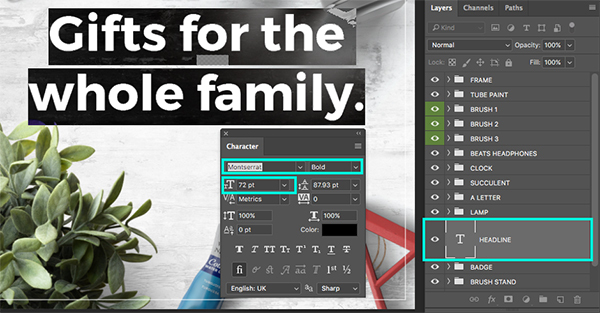 Select the first brush folder, hold the Shift Key, and then select the bottom folder so all three of the brushes are selected at the same time. 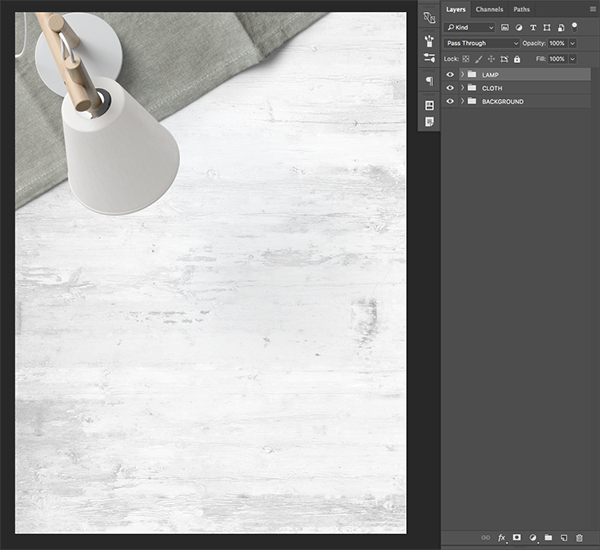 From here, hold Command/Ctrl+Shift on your keyboard and drag the three brushes into your working document and place them at the top of the Layers Palette. 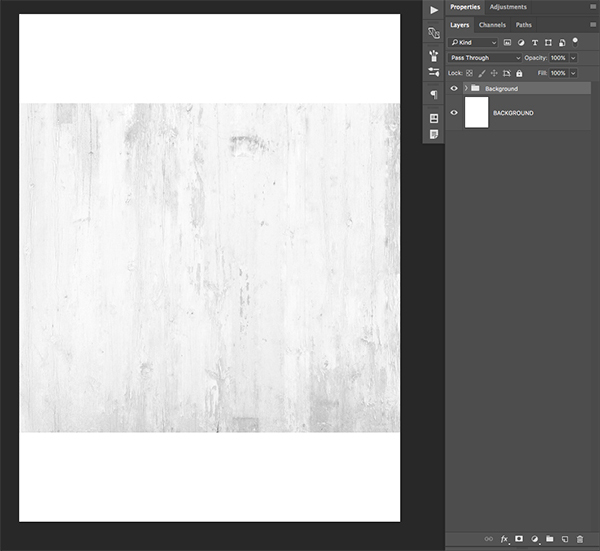 After flipping the brushes horizontally, hold the Control Key and click on the brushes once again. 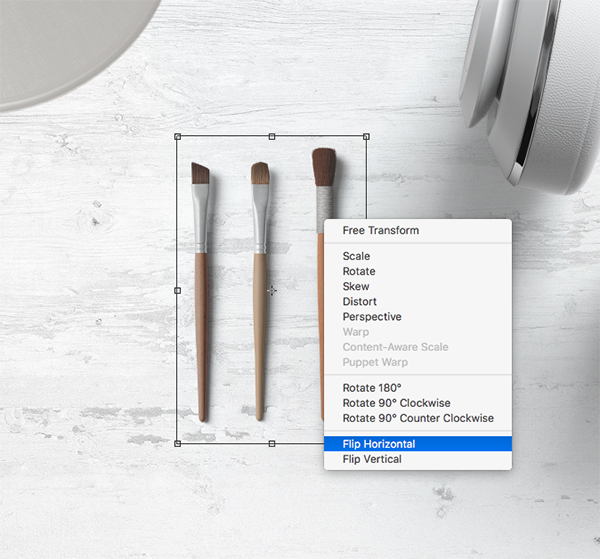 This time we will choose ‘Flip Vertical’ from the dropdown menu. 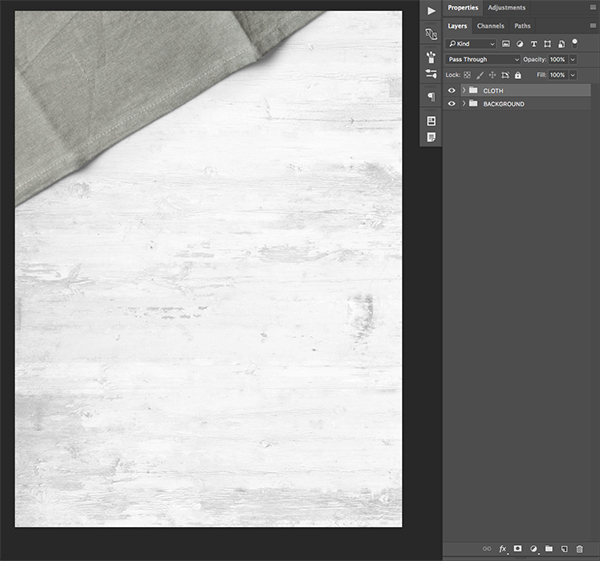 Once you have flipped the brushes both ways, drag them to the top of the canvas and rotate them so they point down and to the right, overlapping the fabric tablecloth. At this point you should still see the bounding box around your three brushes since we haven’t yet applied our transformation changes, which is good. If you did apply those transformation adjustments already you will need to initiate the Free Transform once again in order to proceed. Hold the Shift Key and drag outwards from any of the four corners of the bounding box and scale the brushes up a bit more to make them larger. 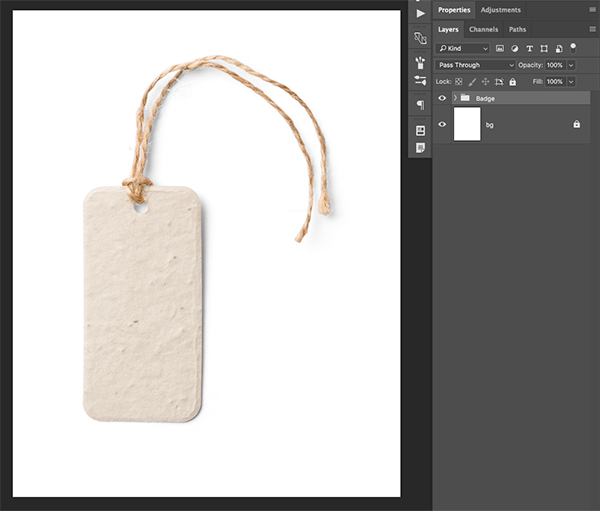 The image below shows the before and after of the resized brushes. 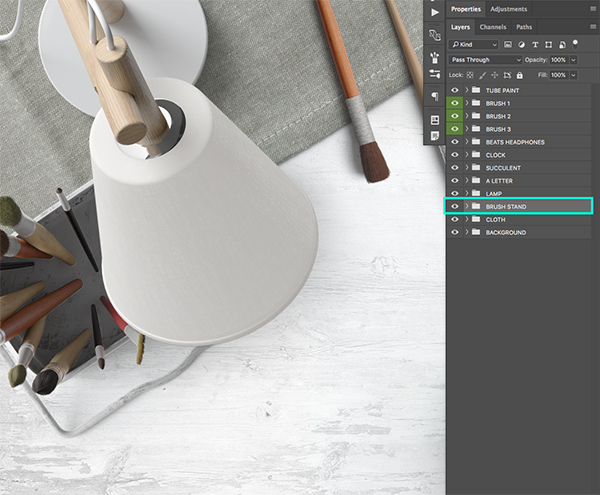 We can now rename each of the brush folders ‘BRUSH 1’ and so forth by double clicking on the name of the folder and entering the new name of our choosing. 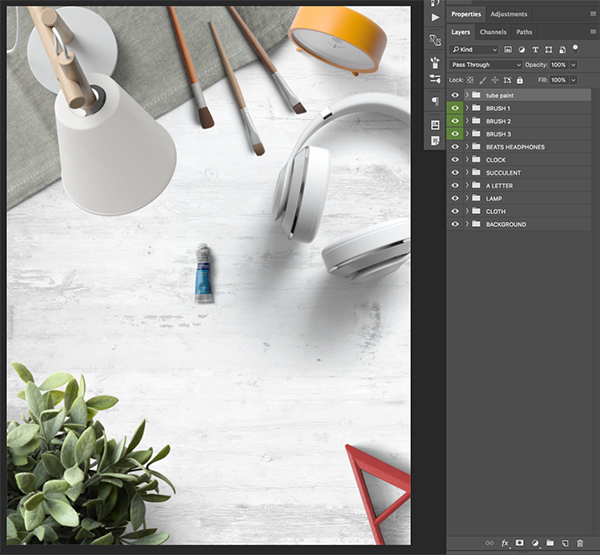 From here we will select each brush individually, press Command/Ctrl+T to initiate a Free Transform, and then offset the brushes by rotating them and moving them slightly apart from one another so they appear more random in their arrangement. 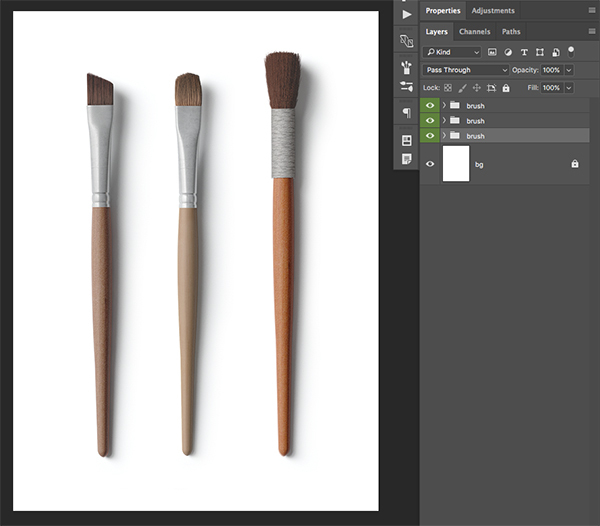 Use the image below as a guide for the size and placement of each of the three brushes. 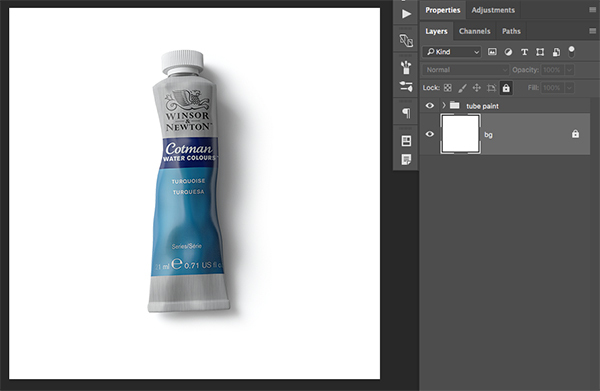 The next object we will open from the freebies folder is the ‘tube_paint.psd’ file. 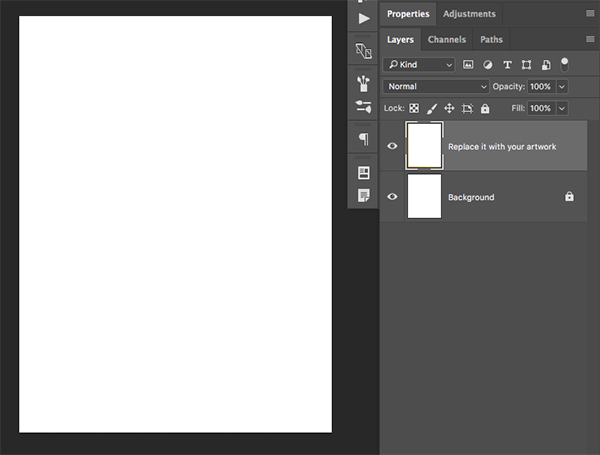 Grab the ‘tube paint’ folder and drag it into your document while holding the Command/Ctrl+Shift keys. 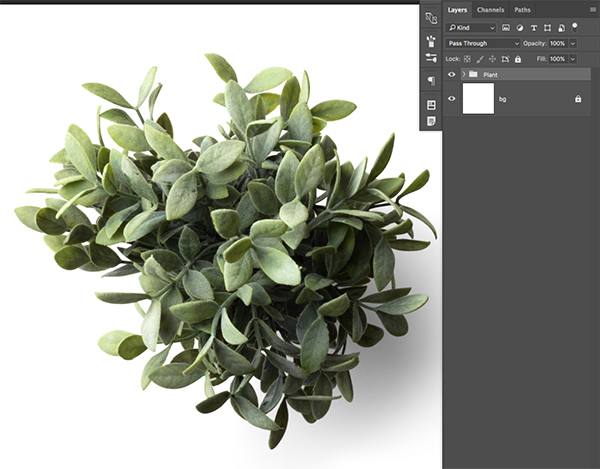 Next, open the ‘brush_stand.psd’ file from the freebies folder for the tutorial. 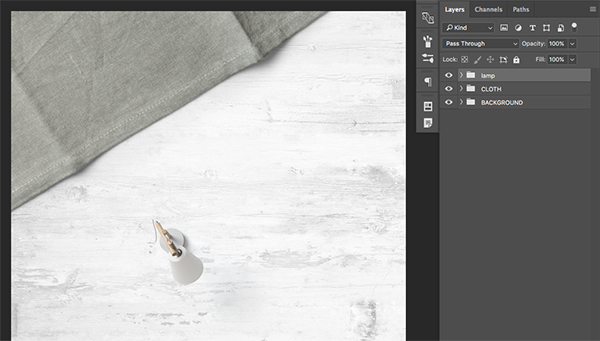 Next, open the ‘badge.psd’ file from the freebies folder. Drag the ‘badge’ folder into your working document while holding the Command/Ctrl+Shift keys, and then place it below the ‘LAMP’ layer if it doesn’t appear there automatically. Next, double click to rename the folder ‘BADGE’ in all uppercase. 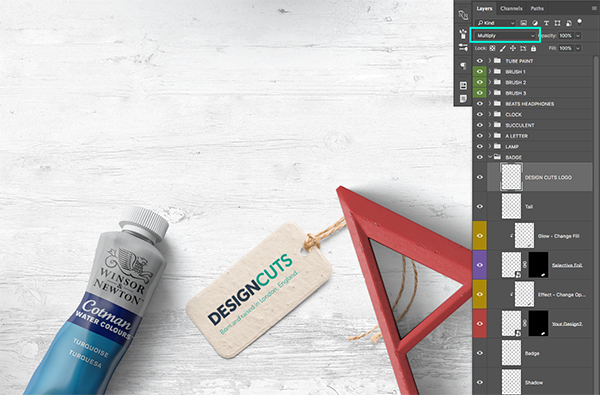 From here we will place the Design Cuts logo onto the badge, so start by opening the ‘design_cuts_logo_on_white.jpg’ file in Photoshop. 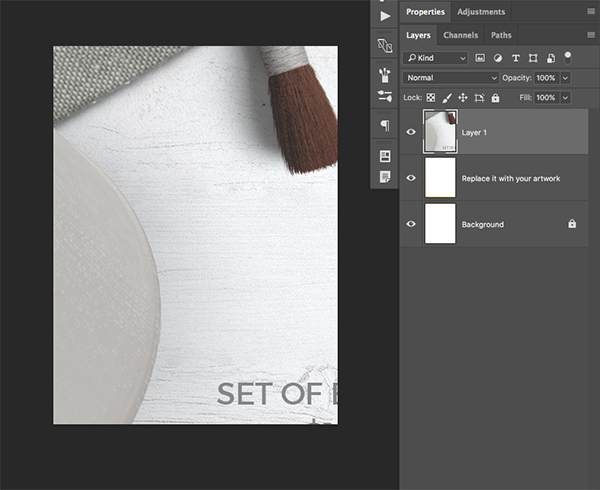 Next, click on the ‘New Layer’ icon found at the bottom of the Layers Palette, and then click and drag to create a thin white border that goes around the whole design while leaving an equal amount of space from the edges on all four sides. 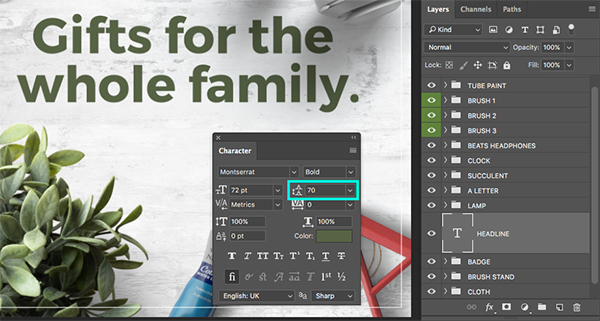 Click on the ‘HEADLINE’ text layer, and then hold the Shift Key and click on the ‘BUTTON’ shape layer so all three of these layers are selected at the same time. 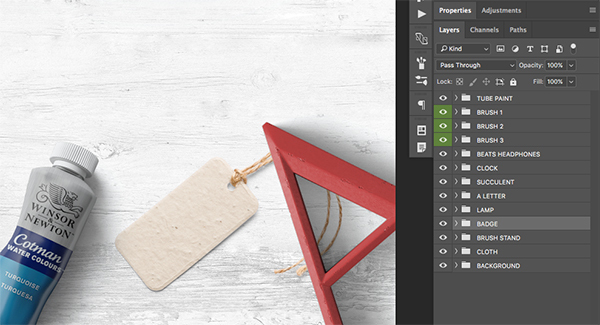 Create a New Layer above your ‘TEXT’ folder and switch back to your Type Tool (T). 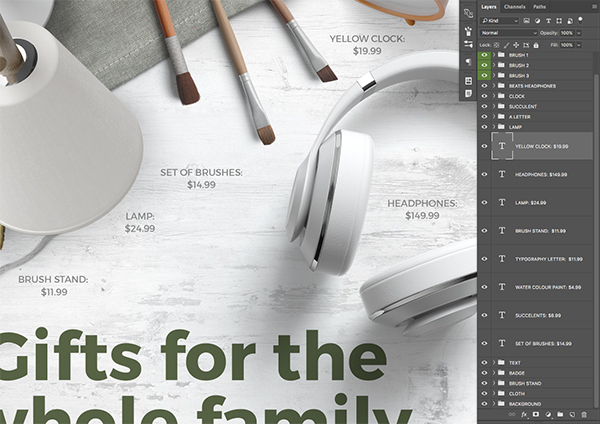 Click to the left and below your brushes and type out ‘SET OF BRUSHES:’ and then hit ‘Return’ on the keyboard to go to a second line before typing out the price ‘$14.99’. We can open the Character Panel once again to make sure that we are using ‘Montserrat’ for the typeface, this time in the ‘Regular’ style. We will also make this type slightly smaller (about 10 point) and change the color to #888888. Press Command/Ctrl+J to create a copy of this text layer, and move it next to another one of the items. 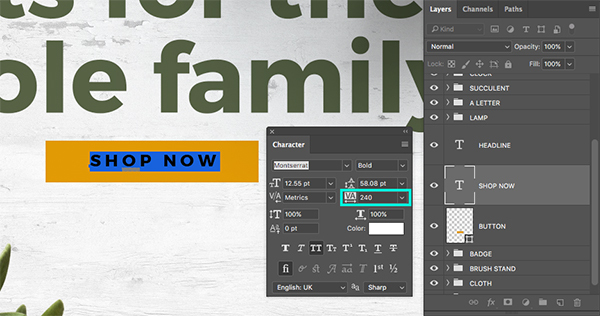 Use the Type Tool (T) to click inside and update the name and price for each item. Continue making copies of each of the product names and prices until you have a copy for each item in the layout. For this I have just made up some prices, but I am using the product name based on the folder name for each item. 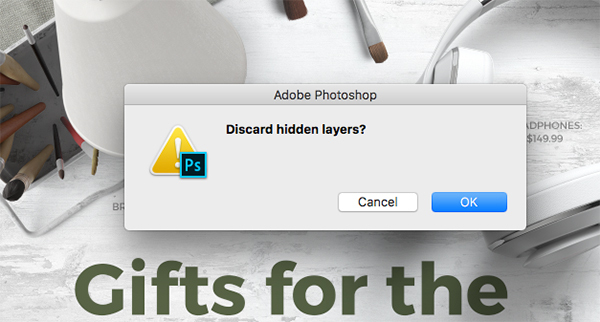 If you are prompted with a dialog box asking if you want to ‘Discard hidden layers?’ you can click ‘OK’ to move on. 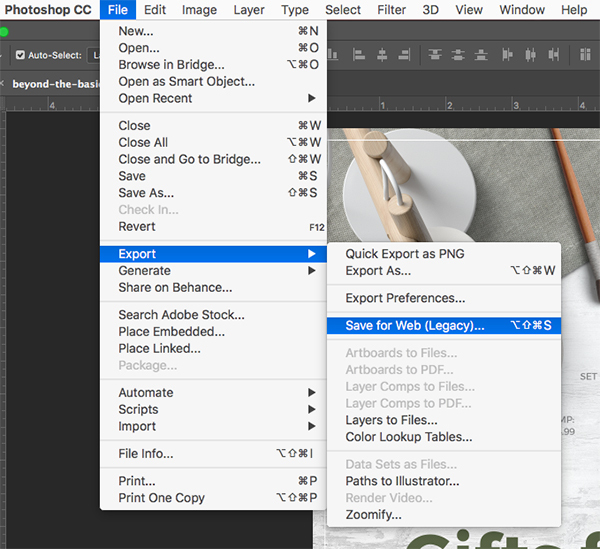 You should now see the export screen asking you how you’d like to save the image. 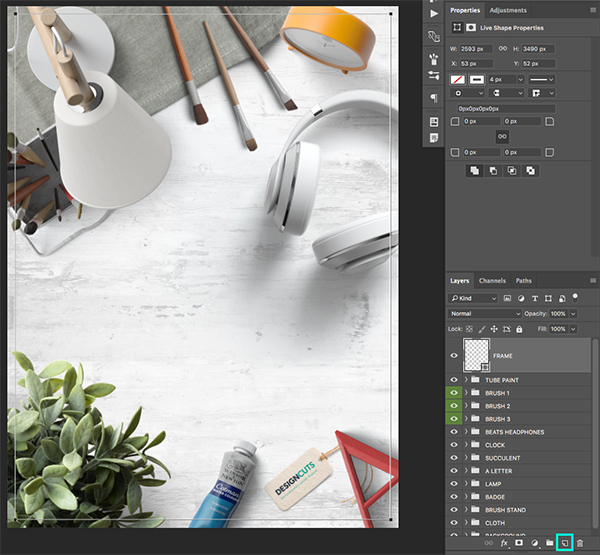 Check the parameters in the upper right hand of this screen to make sure that you have a JPG selected for the file type set to ‘Maximum’ and ‘100’ for the quality. 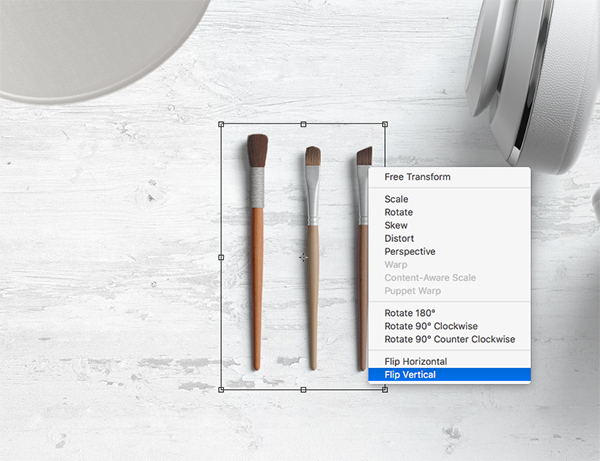 From here you can simply press ‘Save…’ from the bottom of the screen and then choose a destination for your JPG to save. 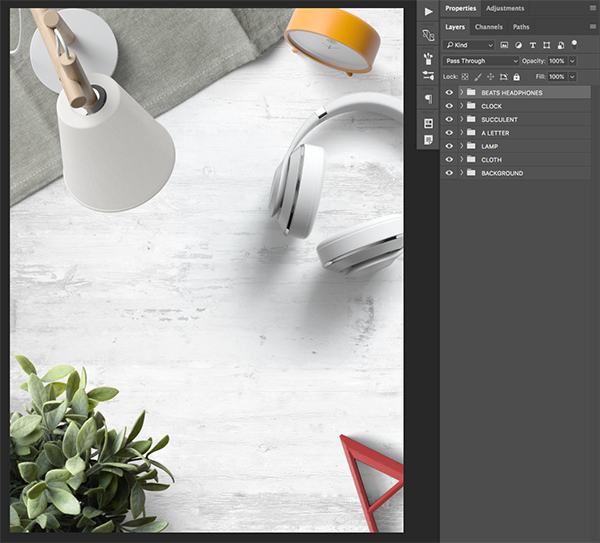 From here, open the ‘Printeriors-07.psd’ file from the freebies folder for this tutorial. Once the file has been opened, click the small arrow next to the ‘All Frames’ folder to reveal the contents of the folder. 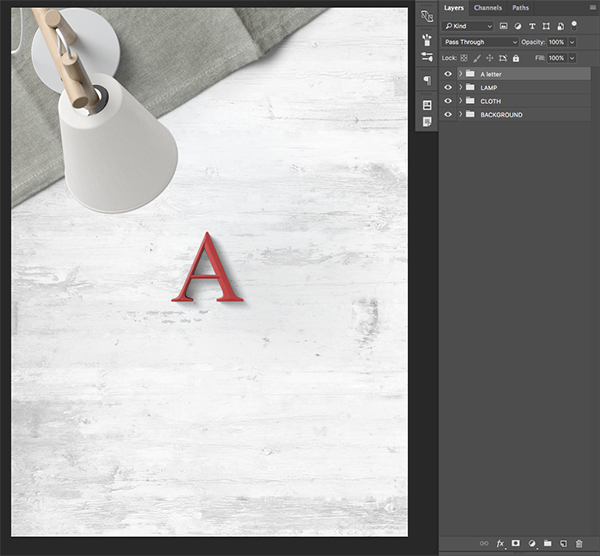 By default, the ‘A4’ folder will be turned on, but as I mentioned in the beginning of the tutorial we will instead be using a larger format for the poster. 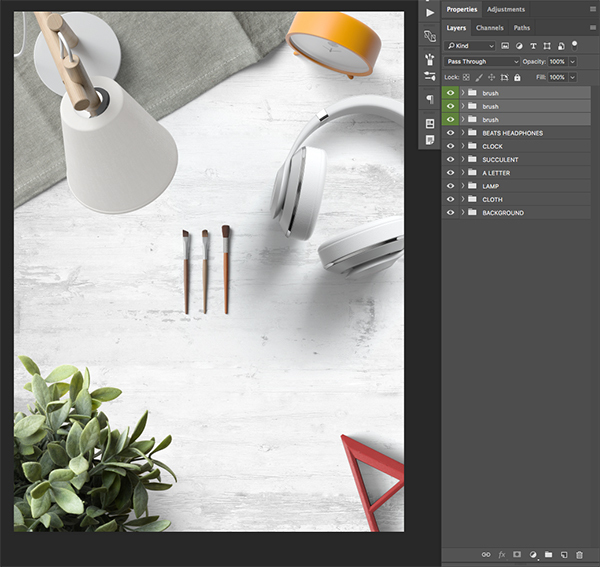 Poke out the eyeball for the ‘A4’ folder to turn off the visibility, and then turn on the visibility of the ‘18×24 in’ folder. After that, expand the contents of the folder and turn on the ‘Black Wood’ layer to change the frame color. Next, click on the ‘Artwork’ folder to reveal the contents and make sure the ‘Artwork with a Mat’ folder above is turned off. 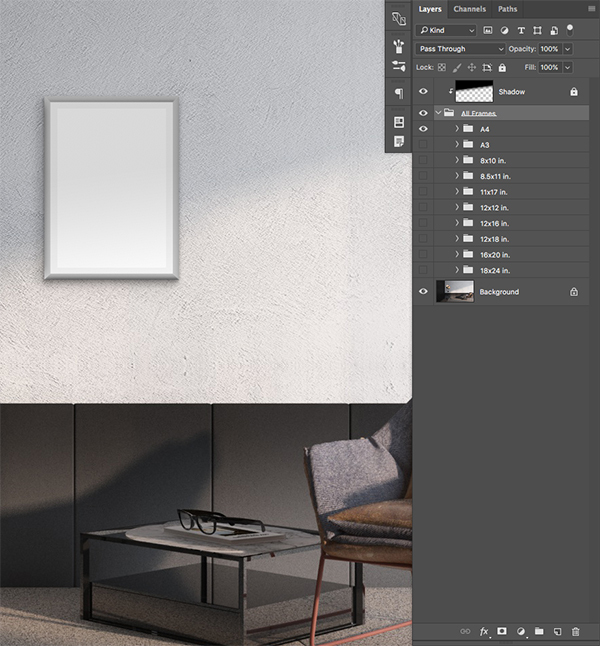 Inside of the normal ‘Artwork’ folder is a Smart Object called ‘18×24 (Double Click to Place Your Artwork)’ which we will double click just as the description says. Inside of the Smart Object Layer we can now see two layers – this is where we will be placing our flattened JPG of the poster design. 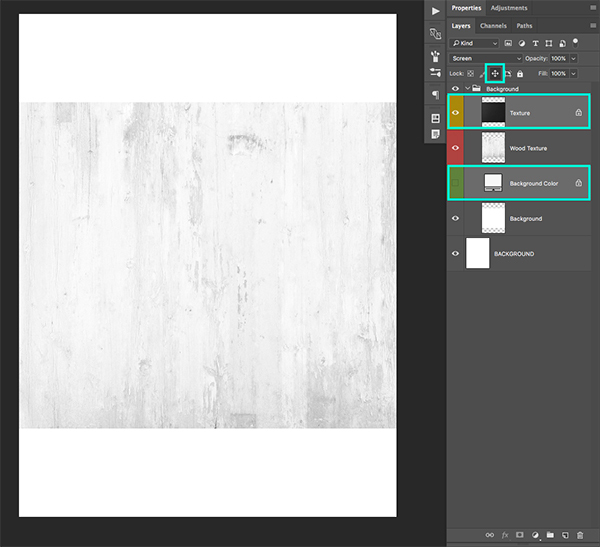 Click and drag the flattened poster JPG into this window and place it at the top of the Layers Palette. 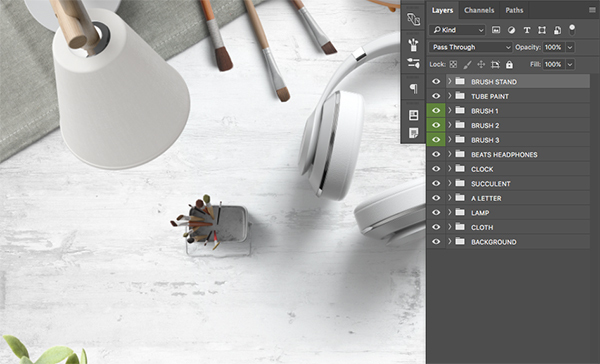 With your Smart Object Layer selected, press Command/Ctrl+T to initiate a Free Transform. From here, press Command/Ctrl+0 on the keyboard to zoom out. Press Command/Ctrl+S to save the file, and then close out of it by pressing Command/Ctrl+W. 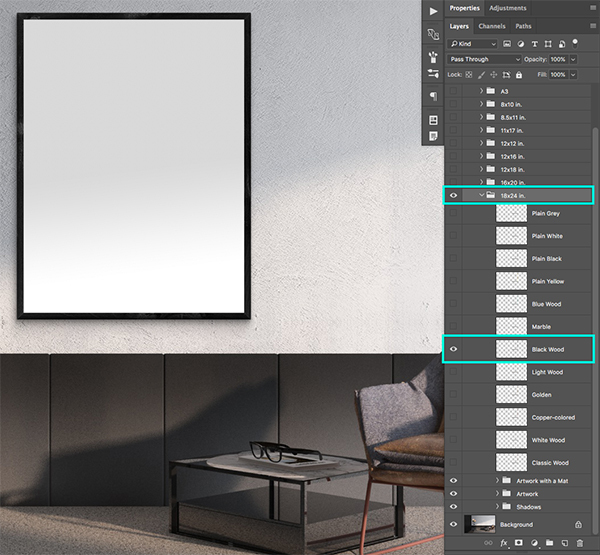 You should now see your poster design updated in the room mockup! 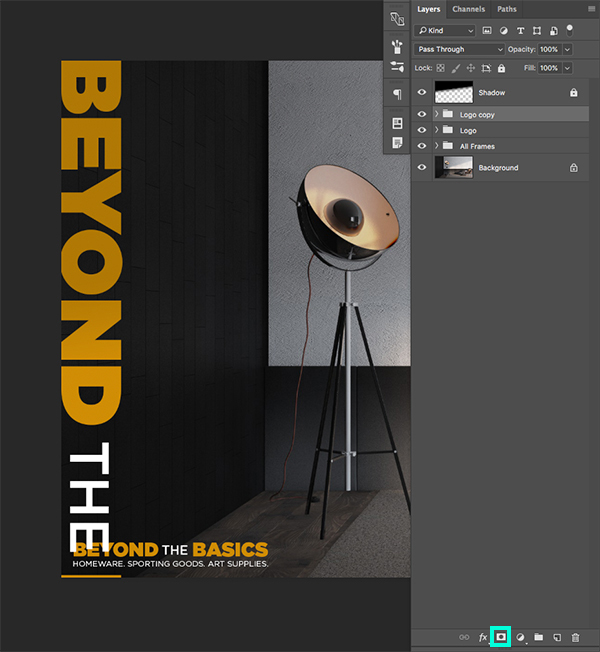 Next, open the ‘beyond_the_basics_logo.psd’ file from the freebies folder. Select the ‘Logo’ folder and then press Command/Ctrl+J to duplicate it. Select the copy and then press Command/Ctrl+T to initiate a Free Transform. 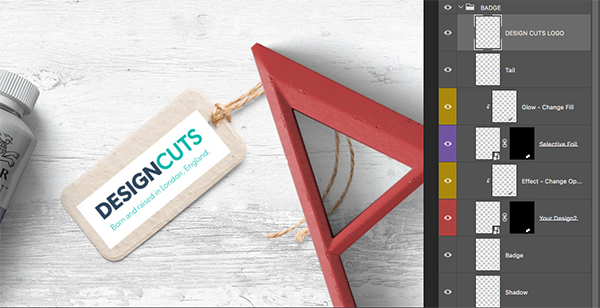 Once you have done that, hold the Control Key and click on the logo to reveal a dropdown menu. From here, choose ‘Rotate 90 Clockwise’ and then press ‘Enter’ on the keyboard to apply the changes. Move this copy of the logo up towards the left of the layout and then once again press Command/Ctrl+T to do another Free Transform. Click a bit off the bottom of the canvas and drag upwards using your Gradient Tool (G) and the bottom of the logo should now fade out. 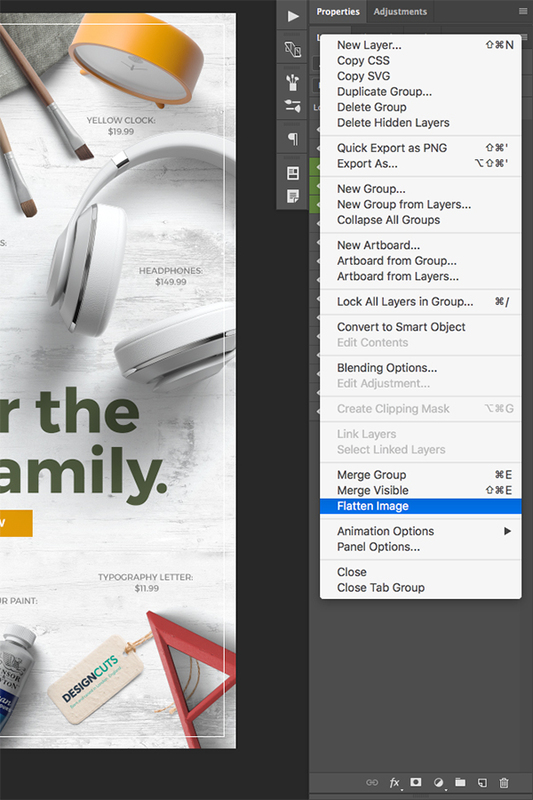 Lastly, change the opacity of the group folder for this logo to 10% by simply pressing the number ‘1’ on the keyboard while the folder is selected in your Layers Palette. 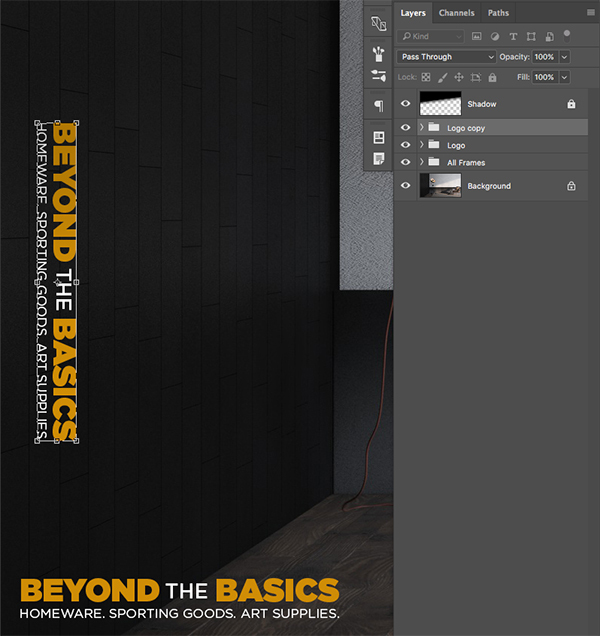 We have now completed our Beyond the Basics Poster Design and Mockup! 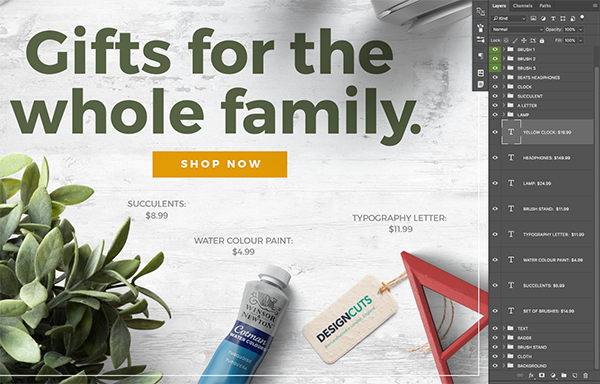 After using just a small selection of the realistic items from this latest bundle we created a fun layout before adding some stylish text. 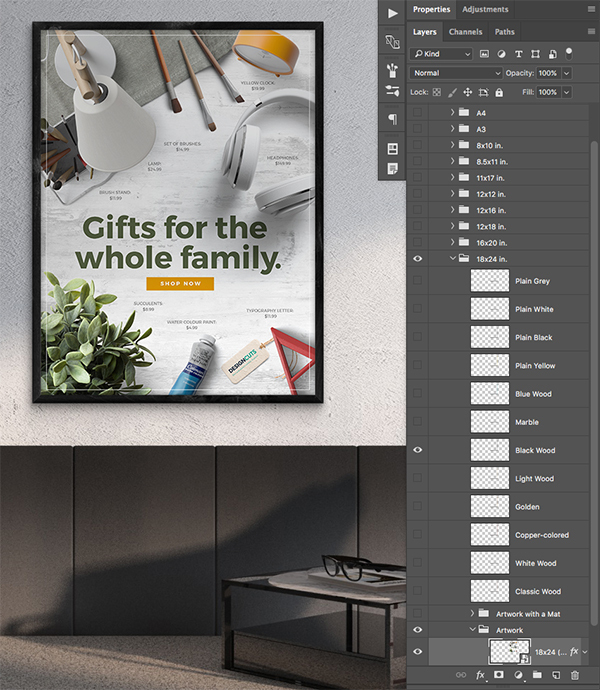 From there, we used one of the many interior mockups to display our awesome poster design before adding a logo and tagline as a finishing touch. 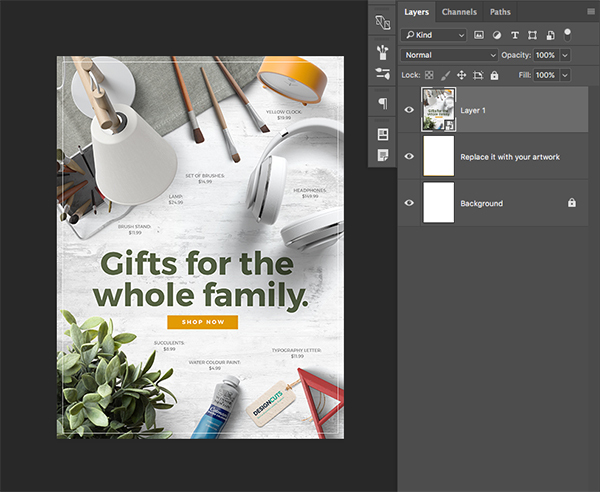 Be sure to pick this bundle up soon as it will help you to create some awesome branded presentations that will really take your work to the next level. I can’t wait to see what you guys do with it! 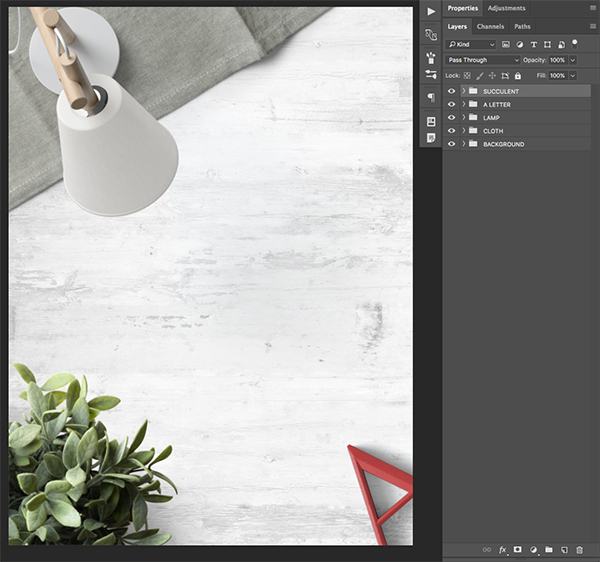 There’s still time to check out The Complete Mockup Templates Toolbox featuring 1000’s of professional mockups for an unprecedented price of just $29. Amen Sarah-Jane! And thank you Mary! I, too, have the same “vision” and am SO glad you brought this up. 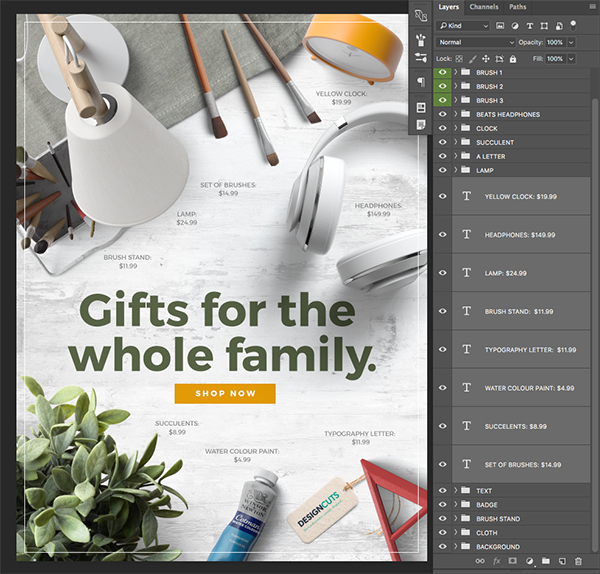 It is also way cool to know that the mock-ups in this AMAZING bundle have added flexibility in them (especially when it comes to lighting). You gals and guys continue to amaze, inspire, and tempt 🙂 Thank you all for another wonderful tutorial (and bundle)! Thanks so much for this tutorial. It is good learning tutorial. Oh thank you for the awesome feedback! oh my the mockup looks great! i’ve never done anything like this, gonna have to try now. thanks a bunch! This is awesome!! Thanks so much for this tutorial. 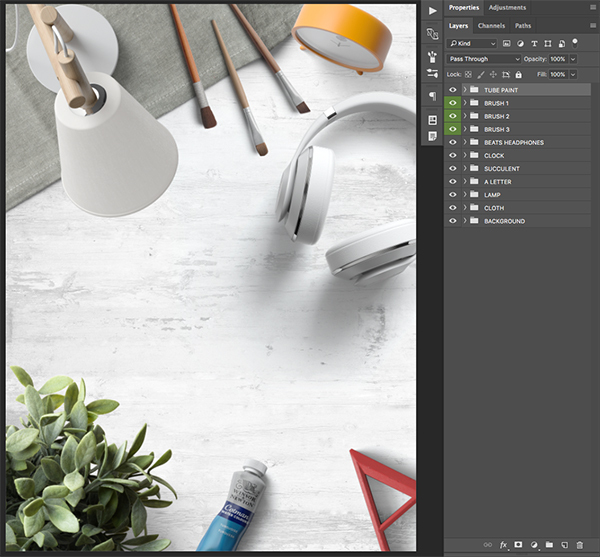 The shadows of the individual objects in the poster composition are not correct. They go every-which-way. This is a mistake I see over and over again. Lighting is important. The shadow cast by lighting is equally important. When both are done badly, it destroys the illusion of reality that you would otherwise achieve. To produce a convincing mock up, one must have a key point of light in mind–as occurs outdoors in nature. If one is mocking up an indoor staged shoot, you need to compensate for 3 light sources: key, back-, and fill light. Again, this is something that I’ve seen few PS mock-ups compensate for. I wish they did! LOL! My eyeballs would bend less often. 2. 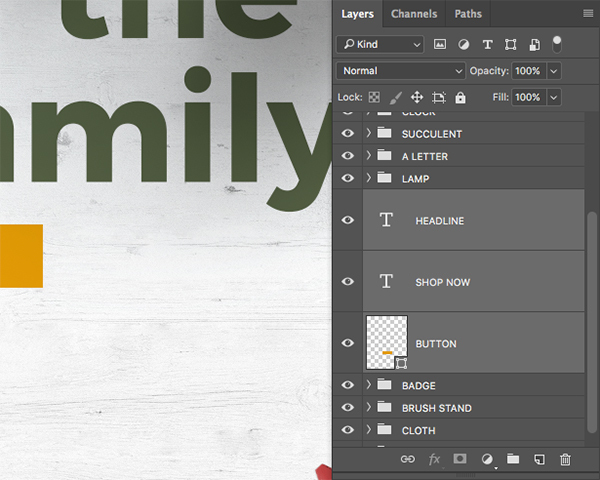 In the Layer Panel, right click on the drop shadow fx layer to bring up the menu for more options. 3. 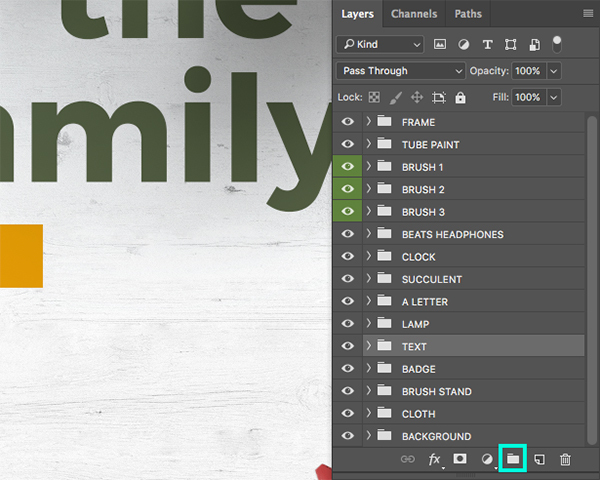 Choose “Create Layer”: this will isolate the drop shadow effect into its own independent layer. 4. 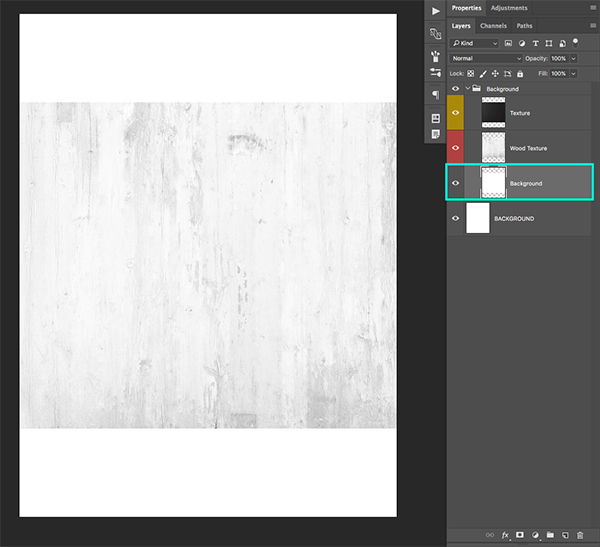 Use the Transform tool to modify the shadow as needed, apply masks, layer adjustments, brushes, etc. until the shadow looks right. That’s it! I don’t have to do this often but when I do, it really helps create the illusion of reality. If the lighting and shadows on the object’s MASS dictates the light is coming from a specific direction, then adjusting the shadow cast by that object has limitations. 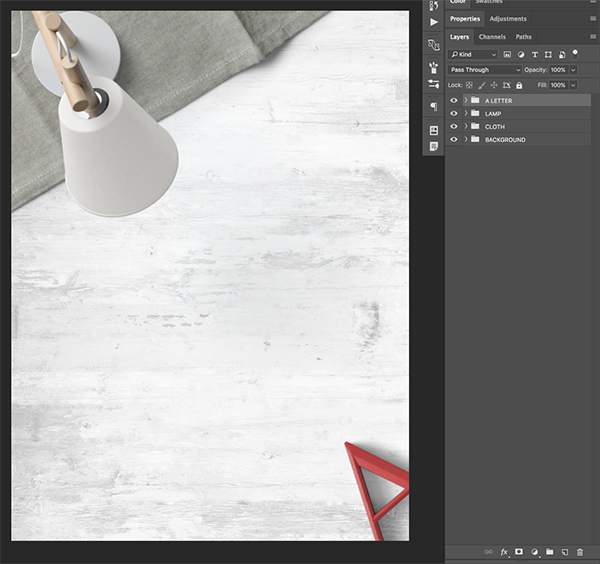 If the table lamp (for example) is lit on the left but you’ve adjusted the shadow to be thrown in the opposite direction, all the “Create Layer” adjusting will be for naught. It won’t look right at all. Thank you so much for taking the time to not only give your feedback on this, but to offer alternative suggestions too! We really appreciate your expertise though and I am sure this will come in super handy for our community.